A tablet for readers has always been a tricky proposition. For starters, the manufacturers that have attempted to create such a thing also make dedicated e-readers -- devices with longer battery life and screens designed to make text look as much like print as possible. Barnes & Noble has given the category a shot with its Nook Tablets, though there are lingering questions as to whether that line will even survive. Amazon, meanwhile, has gone the opposite route, with reading representing just one of many features. Kobo's latest readers see the company doubling down on reading, with a trio of tablets built around a reading core. The Arc 10HD is the top-of-the-line model, a slate that doesn't skimp on the specs (or price, for that matter, at $400). Most notably, it maintains a clear focus, promising to be (in Kobo's own PR speak) "the best 10-inch HD tablet for readers." For Kobo, that means loading up on book-centric features, including one that turns off all of those tablety distractions so you can just read. What, precisely, does it mean to be "the best 10-inch HD tablet for readers"? Does Kobo even deserve that distinction? Most importantly, is it a category within a category that really needs to exist in the first place? 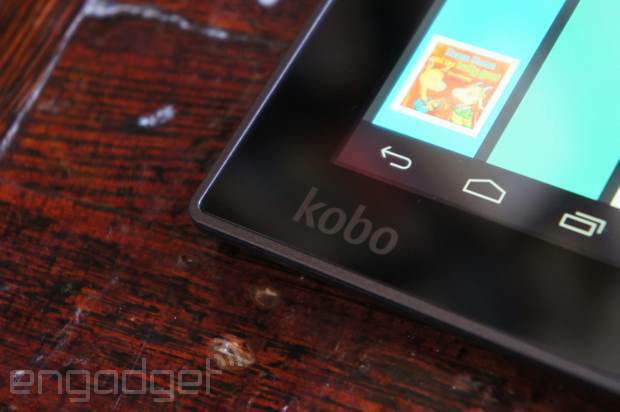 Added reading features aren't enough to help Kobo stand out in a crowded tablet market. Someone over at Kobo loses a few years off his life each time we mention the Vox. 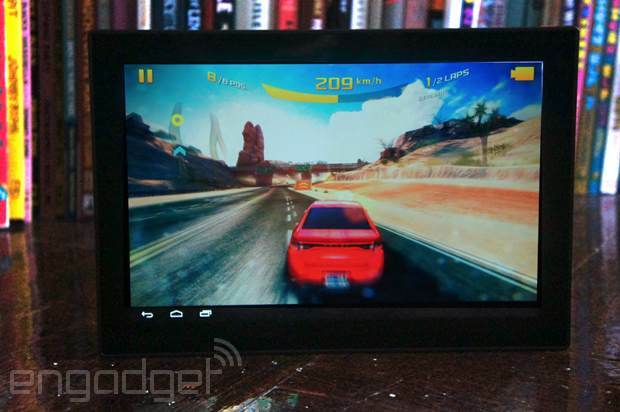 The company's first Android tablet was an epic misfire. It's something you might get were you to force someone to create a tablet against their will: uninspired, clunky and incredibly unnecessary. And while we weren't too bullish about the company's future in the tablet space, the original Arc managed to change our minds. The device was hardly a game-changer, but if nothing else, it proved that the company is capable of building a perfectly serviceable Android tablet. With the Arc 10HD, the company wants to prove it can do a lot better than serviceable. For starters, the 10-inch slate looks a good deal nicer than last year's model. Kobo's dumped the ol' plastic bezels for a contiguous piece of glass, a design choice that puts the product more in line with the company's higher-end Aura e-readers. And it's true, no one's going to mistake this for an Ainovo any time soon. It's worth a reminder, though, that such quality will cost you $400 -- the same price as the new Galaxy Tab 3 10.1. Up top, you'll find a 1.3-megapixel front-facing camera. It shoots 720p video, which should come in handy for VoIP calls. There's no rear-facing camera on-board here, so if you're looking for a photography device, this isn't it. We'll admit that we still feel a bit silly taking pictures in public on a slate, but for $400, this really ought to be a standard feature. 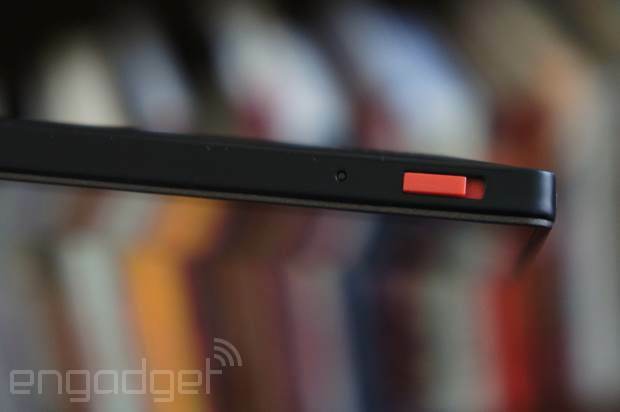 On the top side, you'll find Kobo's signature red power switch; along the right, there's a volume rocker -- the tablet's only other physical button. (Of note: The volume rocker can double as page-turn buttons, if you're so inclined.) The left side, meanwhile, houses all of the ports: the headphone jack, a micro-USB socket and a micro-HDMI connection, the latter of which is notably absent on Amazon's new Kindle Fire tablets. As with the last Arc, there's no microSD slot here, though the tablet does have a decent 16GB of storage built in. As with the front, the soft-touch back has taken a few aesthetic cues from Kobo's Aura line, with slices taken out of the beveled sides. They're mostly there for looks, but they also conform to the hand reasonably well. The speakers have been moved to the rear this time around, with two grilles at the top of the back cover. From a utility standpoint, it's easy to see why Kobo moved them up front last time -- after all, it's a lot easier to hear speakers when they're facing you. Still, the move from a plastic to flush-glass bezel has made the prospect of front-facing speakers a decidedly more difficult proposition. And hey, at least they didn't stick them smack dab in the center. At 0.39 inch thick, the Arc 10HD is notably plumper than the Galaxy Tab 10.1. It's heavy, too, weighing in at 22.1 ounces. Compare that to the Fire HDX 8.9's 13.2 ounces -- or, for that matter, the Galaxy Tab 3 and Xperia Z Tab, both of which come in at 18 ounces. To find a heavier tablet, you'll probably have to go back a few generations -- or look over on the Windows 8 side of the fence, where hybrid PCs routinely weigh around two pounds. It's tough to excuse that kind of heft on a tablet that's designed expressly for reading marathons. Worse, the tablet's bulk is compounded by some uncomfortably sharp corners. Taken together, there's a good likelihood that it'll start digging into your hands. Though perhaps there's something to be said for those who miss the papercuts of physical books. 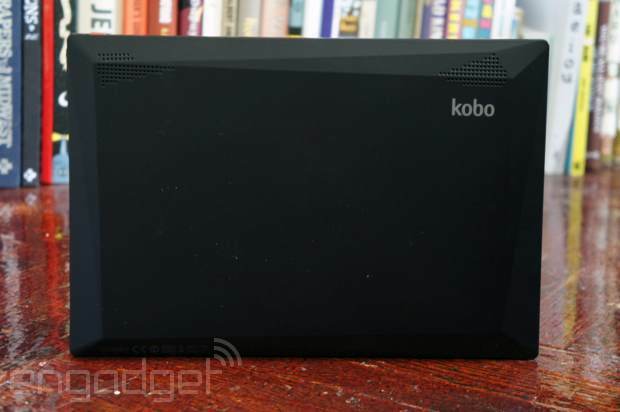 Kobo isn't offering up a lot of choice on the storage front. At the moment, you're limited to 16GB. But that should be plenty, if you're only planning to read, right? As far as processing power goes, the Arc 10HD packs a quad-core 1.8GHz Tegra 4 chip-- a healthy bump over the 1.5GHz processor used in last year's model. You'll also find 2GB of RAM, double what's included in the Arc, putting the Kobo on par with other tablets in its size class. Unlike Amazon's Fire HDX line, however, you won't find any "console quality" graphics here. Not until a case can be made for needing them to enhance the reading experience, at least. 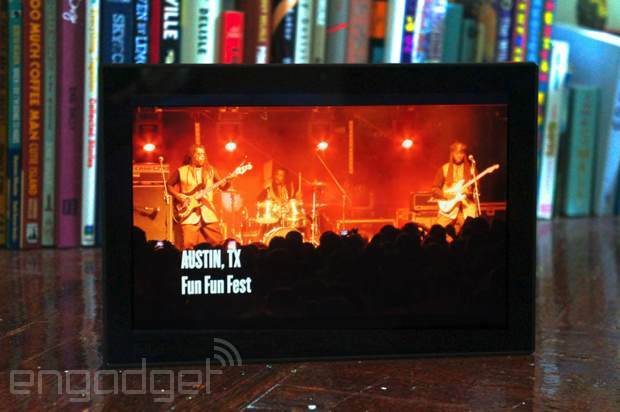 We'll be honest: It's hard looking at most displays after spending some serious time getting to know the Kindle Fire HDX. That said, Kobo's offering is nothing to sneeze at. The Arc 10HD has a lovely 2,560 x 1,600 display -- that's the same resolution as the HDX 8.9, spread out across 10.1 inches. It's also the same resolution as the Note 10.1. That all works out to a screen density of 300 pixels per inch, which should be more than enough to read just about anything, including glossy magazines. Turns out it's pretty good for watching movies, as well. Though we did notice some issues with the color balance, which tended to make some of the brighter colors look a bit oversaturated. Aside from changing the speaker placement, the Kobo team doesn't seem to have given much thought to audio quality. It's the same deal as with other tablets: tinny sound that gets progressively more distorted as you crank up the volume. It'll do in a pinch for short video-watching stints, but if you want to listen to music or sit through a full movie, we'd strongly suggest a Bluetooth speaker or a pair of headphones. 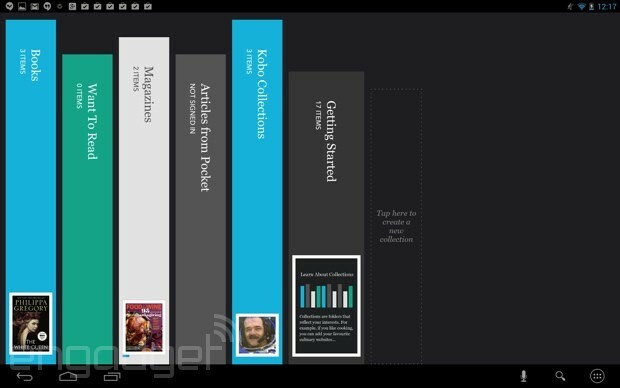 Reading tablet or no, Kobo hasn't skimped on the internals. In fact, if all you're planning on doing with the thing is reading books and the occasional magazine or comic, the device probably has more horsepower than you'll ever need. But let's be honest for a minute: No one's plunking down $400 for a tablet that does just that. Thankfully, the Arc 10HD performs solidly. Apps open quickly; browser navigation is a breeze; and even a round of Asphalt 8 went off mostly without a hitch, though the graphical rendering left a bit to be desired. The slate also scored reasonably well on benchmarks, too, racking up a 13,447 in Quadrant, 1,078 in Vellamo and a solid 637ms in SunSpider (lower numbers are better there). According to Kobo's numbers, the Arc 10HD's 6,550mAh battery should give you up to 9.5 hours of battery life. We got significantly less than that in our testing, however -- just seven hours and 22 minutes. It's nowhere near the iPad Air's 13-plus hours, but it does handily beat some other 10-inch tablets, like the Galaxy Tab 3, which only managed six hours and 55 minutes. Also, keep in mind that our battery test involves running a movie in loop. If you are, indeed, using the slate primarily for reading, you'll likely be able to rack up many more hours on a charge. "Unrestricted access to Google Play" -- we're pretty sure that's the biggest dig against Kindle's Fire line in the Arc's marketing materials. 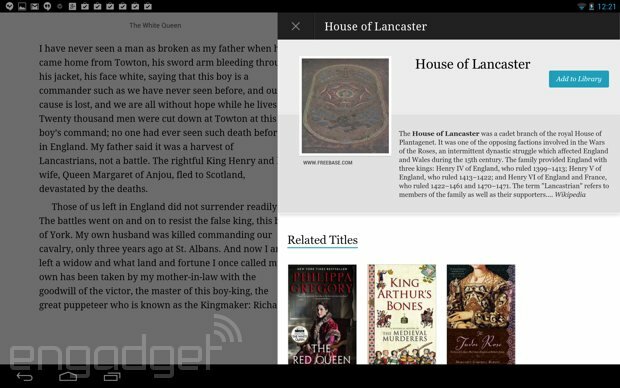 Kobo runs Android 4.2, which means, among other things, that unlike with Amazon's tablets, you'll be able to download from the Google app store. That's not to say, of course, that we're dealing with vanilla Jelly Bean here. Building "the perfect reading tablet" means tweaking things a bit on the software side, and tweaking things a bit on the software side means skinning. Kobo's applying the Reading Life brand to the experience -- a name that once solely referred to the company's lackluster social awards offering. There's a new toolbar on the ride side of the home screen. At top, you'll see a photo of the currently logged-in user, plus quick links to the browser, apps like Gmail and Facebook and, naturally, the Kobo Store. Swipe to the left to reveal your Kobo home page. Here, you'll find a number of your recent books and magazines (along with the amount of time left to read in each and number of bookmarks), recommendations, links to lists and other discovery methods. We appreciate how easy Kobo has made it to access such information, but the layout's a bit of a mess. The rows aren't particularly well-organized, and things are split pretty evenly between your library and different methods of recommendation. We'd love to have a clean, easily parsed library offering front and center. Thankfully, it only takes another swipe to get you there. The Collections layout is a much simpler, cleaner affair, with texts organized into different categories like books, magazines, articles from Pocket and whatever custom groups you create by clicking on the right side. There's also a handful of Kobo Collections -- books assembled by curators like astronaut Chris Hadfield, who, it turns out, really likes reading about space. Interestingly, you've got to be online to check those collections out. The page is lovely from an aesthetic standpoint, with thin rectangles and a blue-green color scheme. Hey, if Kobo ever does opt to do a full OS skin, we'd strongly suggest this as the basis for an across-the-board design. Like any other groupings, however, you've really got to maintain things if you ever want to find anything. And what of the reading experience itself? Load a book and you'll see a nice little animation of a bookmark being pulled off the page, signifying that you're picking up where you last left off. By default, there's no page-turn animation, but you can get the book to fade, slide or curl between transitions in the settings menu. For prose books, the pages are largely dominated by text, with the title of the book atop the left page and the chapter and page progress on the right. Tap the circle in the bottom left-hand corner and options will pop up. From here you can adjust settings, read notes and change the page style and font options. There are three colored reading themes: classic (black on white), night (white on black) and sepia. There are only three font sizes available here -- far fewer than on Kobo's e-readers. 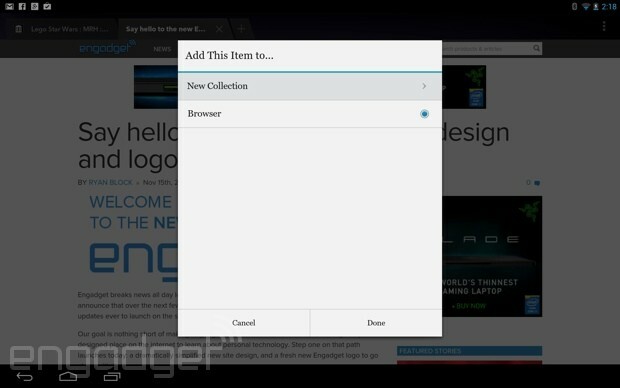 The font slider, however, assures that there are plenty of different size options. Tap the upper-left corner and you'll see a dog's ear folding animation holding your place. Touch the bottom of the screen and you'll get a slider to move your place in the book. You can also access the table of contents by tapping the page. Hold down on a word to highlight text. From there, you can also add a note, perform a search and share over a variety of options, including Facebook, Twitter, Pinterest, Pocket, Google+ and, naturally, add it to your Kobo Collection. Highlight a single word, and you'll be able to look it up in the dictionary, Wikipedia or perform a Google search. This is Kobo's response to Amazon X-Ray, a way of serving up some contextual information from directly inside the book. Kobo's offering no shortage of ways to access the feature, including an icon at the bottom, underlined keywords and a link when you pull up the top toolbar in the book. If that all gets to be too much, you can make the icons and lines disappear in the settings. Tap an underlined item and a window will pop up offering information about the item -- along with a couple of related books, in case it piques your interest. Tap the Beyond the Book icon and you get all of those terms in one place, along with shared notes from fellow readers, stats such as the number of people who have finished reading the book and information on the author. At present, the offering doesn't feel especially robust, particularly given what Amazon has been doing with X-Ray. Admittedly, though, Amazon did get a two-year head start. That said, Behind the Book is much worthier of Kobo's time than the first version of Reading Life. With a little TLC, it could prove to be a solid addition to the Kobo ecosystem. Let's face it, when it comes to reading, everything else just gets in the way. That's the premise of Reading Mode. All of those pesky features that come with the world of tablets, like WiFi and notifications, become mere nuisances when you're mid-book. 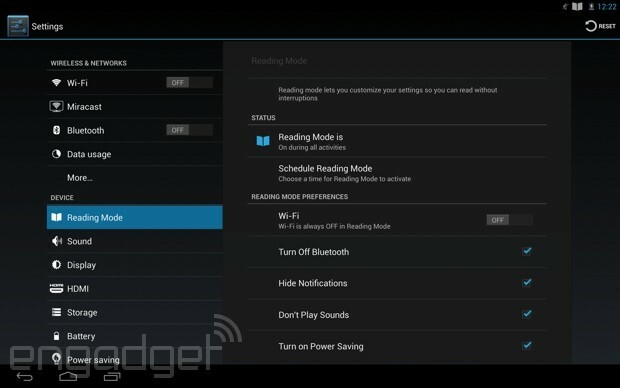 By default, Reading Mode will disable those features and shift into power-saving mode to give you more time to read. You can also access Reading Mode in the settings to customize what gets disabled and what doesn't. Beyond that, you can schedule the feature for future usage. It's a handy feature, certainly; in fact, Amazon rolled out a similar one in the latest version of Fire OS. It does, however, bring to light some of the issues with using a tablet as a full-time reading device in the first place. There are a couple more quick features worth mentioning. First, that Pocket integration touted back at the initial launch event has indeed been baked in here. We won't lie: The feature was more exciting over on the e-reader front, where it's more difficult to browse the web, check e-mails and move content onto the device. Here, content saved to Pocket will show up in the Collections area, giving you easy access to saved pieces when you can't get online to read them. Offline reading and sharing to Pocket/Collections has been built into the browsing experience as well, making it easier to save news stories for later. Will anyone argue with Kobo's claims of offering "the best 10-inch HD tablet for readers"? Probably not. After all, it's not exactly a hotly contested category at the moment. For one thing, Amazon's line only goes up to 8.9 inches -- and the company's clearly more focused on other media offerings, saving its reading push for e-readers. As such, Amazon's got Kobo out-specced, with a high pixel density (339 pixels per inch to Kobo's 300), a faster processor (quad-core Snapdragon 800) and an Adreno 330 GPU, to name a few. The Arc's software offerings also aren't quite as compelling as the Fire's -- there's nothing in the way of Mayday live tech support, and Beyond the Book has a ways to go before catching up to X-Ray. Kobo does have at least one advantage over Amazon here, though: open access to Google Play. That's something that can't be understated for more advanced users. For the past few generations of products, Kobo has struggled to figure out what it could bring to an overcrowded tablet market. The company has seemingly settled on the goal of making "the best tablet for readers." It's not an empty claim. 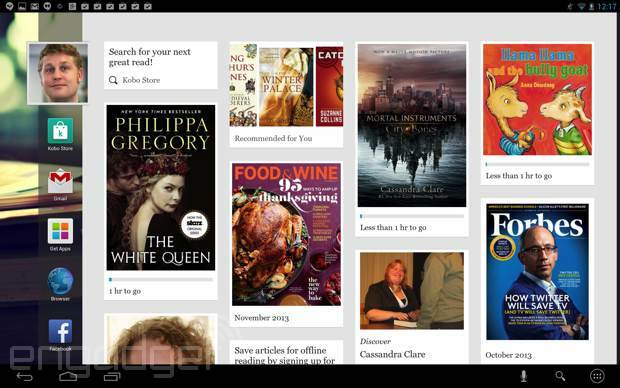 Kobo has added a lot to stock Android here in order to improve the experience for readers. There's nothing here, however, that truly sets the Reading Life experience apart. And while Reading Mode will help users ward off distractions, the setting just drives home the reasons why tablets might not be ideal for reading in the first place. That said, Kobo's actually managed to put out a solid device here. The screen is nice (if, again, a bit oversaturated) and the internals are on par with the competition. At $400, so is the price. We do wish the tablet were a bit lighter and that the battery lasted longer without help from Reading Mode. For the most part, though, the Arc measures up. Kobo's managed to make some dramatic improvements with each subsequent generation, so hopefully the next time out, the company will address those issues -- and come up with some meaningful upgrades that will really set it apart.